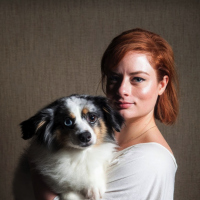 Katie Hughes, VR Product Designer, Beast, Inc.
Katie Hughes leads product design at Beast Pets, a San Francisco-based startup making smart and magical pets for XR. She is co-founder of the Room Scale Designers meetup group, and previously worked as a VR UX/UI designer at YBVR. As an emerging tech enthusiast, VR hackathon addict, and UX design evangelist, she is passionate about designing for an inclusive and ethical technological future.